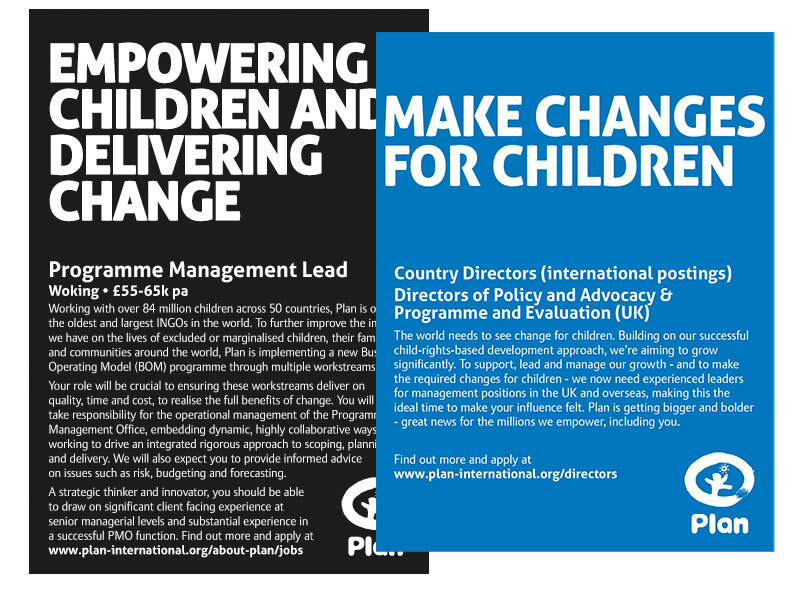 Plan – one of the world’s largest charities who helps a staggering 84 million excluded and marginalised children around the globe – gave us the challenge to pull an extensive media schedule together to raise their profile with senior business leaders as they looked to recruit Country Directors in more than 30 different locations around the globe. To add to the difficulty factor, we needed to gather the information together over the Christmas and New Year holidays as the campaign was scheduled to go live from the second week in January! Utilising international rep houses based here in London, affiliate partner agencies in some parts of the globe, and direct contact with the local media (often in their native tongue! ), we pulled a truly extensive campaign together than identified and costed the premier news/business media titles and their online partners in countries as diverse as Thailand, Brazil, South Korea, Canada, Australia, and Finland to name but a few. We wrote and typeset a simple advert with a strong headline designed to grab the attention of the viewer. The campaign went live on schedule and our active buying secured savings in excess of £20k against rate card. The campaign was an opportunity to raise the profile of the organisation and drive traffic to the client’s website where details on the various Country Directors and other senior roles at the charities could be accessed and applications made.